The West Coast Meat & Produce Export Company started production in August 1883. The intention was to freeze meat, but at first only canning facilities were installed. The slaughter house was erected where the Patea High School grounds are now. Stock was slaughtered there, then transported across the Bridge to the Preserving Works, where it was cooked & tinned. This innovative industry went into liquidation as the result of a fire in May 1885. At the end of 1887 Mr Orlando W Oldham, Manager of the Gear Meat Company Wellington was instrumental in starting the industry again in Patea under a sort of co-operative arrangement, which commenced killing stock in February 1888. This was known as the Western Packing and Canning Company, and was built on the area of land known as 'Raumano' Place of many leaves, beside the Patea River. There was accommodation for staff and a Post Office named “Canville” was opened in 1891. Late in the evening of 1 June 1897 fire broke out and destroyed the slaughter house and tinning building, the boiling down plant was also partially damaged but the outbuildings were saved. Mr Oldham personally lost heavily, of his loss of £5,000 only £1,200 was covered by insurance. But inspite of this hurdle, public subscription and more capital enabled the concern to redevelop on an even larger scale. The reopening was held on 5 April 1898 when despite rain there was a good gathering of country settlers. The new works covered twice the area formerly occupied and new plant and appliances had been installed. Capacity was expected to rise to a thousand sheep a day which would employ more than 60 men. Beef was to be taken in hand at the end of the sheep season and there was also talk of processing pork for the first time so that operation would continue all year. In 1901 meat inspection was made compulsory and all tins had to carry a label certifying that the meat had been killed and dressed under Dept of Agriculture Supervision. And the following year, financial hardship meant that the Directors were authorized to sell the Works as a going concern. Robert Darling became proprietor for two years, and then Thomas E Thompson, who began doing what the original creators of the business, had wanted to do all along…Freezing Meat. The Patea Freezing Company, as it was now called, exported 1472 frozen carcasses in 1905. From then on the Works handled 50,000 sheep and 4000 cattle annually. The first major industrial strike was held in Wellington, with Solo Butchers wanting an increase in their killing rate from 20 shillings per hundred sheep to 25 shillings. By 1920 the record number of 89,869 sheep & lambs were killed & processed; but then disaster struck when the whole years production was held up by a shortage of Shipping due to WWI, and sold eventually at a huge loss. This was a major catastrophe for Patea, and particularly the Managing Director Mr Walter D Powdrell, who also had interests in four East Coast Works. He took his own life. This exporting failure instigated the establishment of the National Meat Producers Board in 1921, to control meat shipments, grading standards, freight rates, etc. Mr Charles D Dickie became the Chairman in 1922 and worked hard to salvage the Co-operative. In August 1924 a new Patea Farmers Co-operative was established, and business continued. In that season 3533 tons of frozen meat and 49 tons of case meat were exported. In 1926 the Company pioneered the Bobby Calf industry, “paying one bob per calf” hence the name. By 1931 Bobby Calves were worth over £25,000 a year to the farmers of South Taranaki. 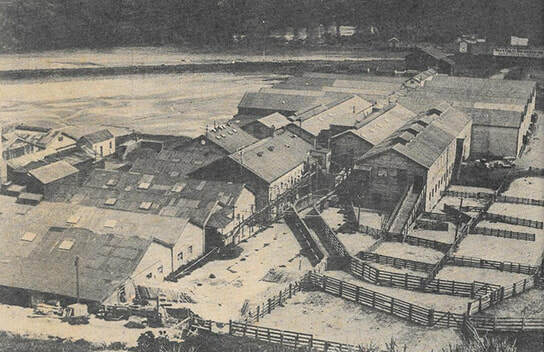 The Works expanded to cover four acres with storage for 172,000 carcasses and employment for 180 men. Shipping the meat to Wellington ended in 1929, after a new Rail siding was put in. A new Pig killing area was built in 1928/29. The depression again put the Works in jeopardy and negotiations were made with both Borthwicks and The NZ Refrigeration Company. The latter took out a 10 year lease, but withdrew after only a couple of years, in October 1933, forcing the Farmers Co-operative into liquidation. A new private Patea Freezing Company was formed by some of the guarantors: CD and HG Dickie, AT Wills, CR Honeyfield, BC Lysaght, JC Hawken and AET Symes. They opened negotiations with W and R Fletcher Ltd, a subsidiary of the Vestey Organisation. The take- over was achieved. Lord Vestey visited the Patea Works in April 1934 and a programme of up-grading was begun. The take-over was not unchallenged, for it had been Meat Board policy to keep foreign ownership out. However the government was presented with a fait accompli and retaliated by putting the works on a quota of a maximum of 250,000 sheep & lambs. Vestey’s takeover averted the almost certain closure of the works in 1934. During the 1930’s an ill-advised strike had led to the introduction of the chain system, putting an end to the highly skilled ‘solo butcher’. The 1951 strike resulted in de-registration of the national union and the formation of a separate ‘shed union’ at the Patea Works. 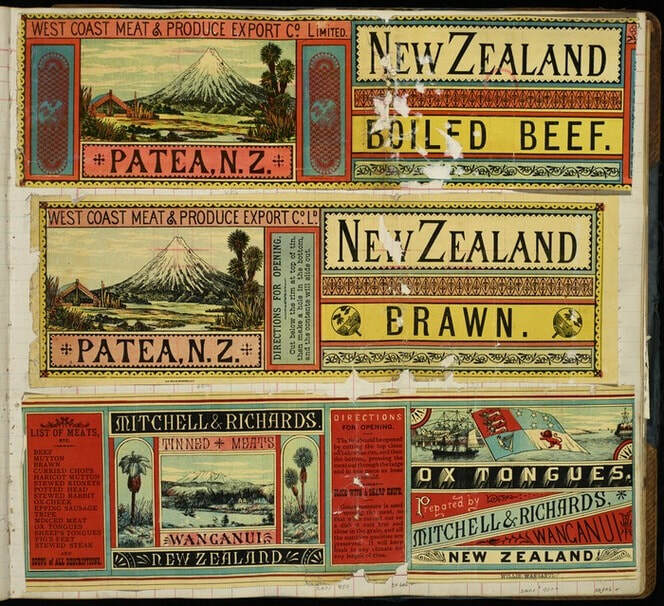 Until 1954 Britain took all New Zealand’s meat, but since then markets opened up in Europe, North America, Asia. And Halal slaughter men were employed at Patea to cater for the Middle East market by the 1970’s. In the last couple of decades an average of 3200 sheep were killed in a day at the Works. There were 32 men on the chain, doing 100 a day each. And a maximum of 400 Beef cows could be killed and processed in a day. At least 3 meat inspectors were on the floor at any time. A new cool store was built in 1964, and doubled in size in 1969. In 1973 an upgrading programme worth several million dollars was undertaken. Production in the 1978/79 season was valued at $24 million, and employment was provided for 800 workers. On Friday 3 September 1982 the Patea Freezing Company closed after almost 100 years of operation.